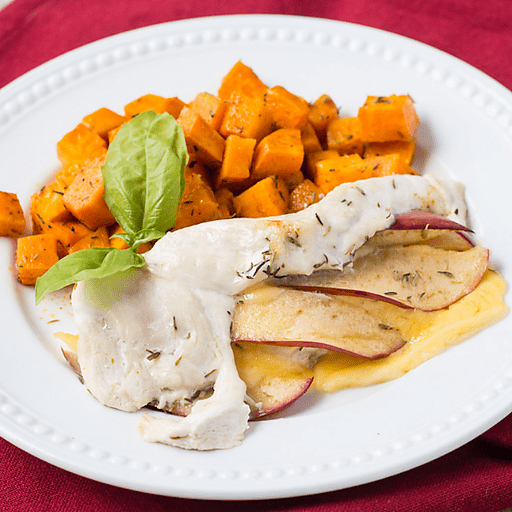 Filled with sweet apple slices and creamy Gouda cheese, our Apple Gouda Stuffed Chicken with Sweet Potatoes is a delicious, fall-inspired sheet pan meal. 1. Preheat oven to 425°F. Spray a rimmed baking pan with cooking spray and set aside. 1. Butterfly each chicken breast (or cut each breast so it opens like a book and lays flat). Dividing the cheese and apple slices evenly, lay the cheese and apple slices onto one side of each chicken breast. Sprinkle ¼ tsp. dried thyme over all of the apple slices. Fold chicken and drizzle with 1 tsp. olive oil. Place chicken on baking pan. 1. In a large bowl, mix together diced sweet potato, remaining 1 Tbsp. olive oil, smoked paprika and remaining ½ tsp. thyme. Arrange sweet potatoes in an even layer around the chicken on the baking pan. Bake for 20 minutes, stir sweet potatoes, and continue to bake until chicken is done, about 10 additional minutes. Serve. For dairy free: Use Gouda style cheese substitute instead of Gouda cheese. Calories 330, Total Fat 12g (Saturated 3.5g, Trans 0g), Cholesterol 110mg, Sodium 190mg, Total Carbohydrate 15g (Dietary Fiber 3g, Sugars 6g), Protein 39g, Vitamin A 220%, Vitamin C 20% Calcium 10%, Iron 10% *Nutritional values are an approximation. Actual nutritional values may vary due to preparation techniques, variations related to suppliers, regional and seasonal differences, or rounding.